The cutting edge of 19th century aerospace technology will be on display at the National Mall on Saturday. The National Air and Space museum has inflated a 19,000 cubic-foot gas balloon, wrapped in rope netting, in honor of Thaddeus Lowe, one of ballooning’s early champions. 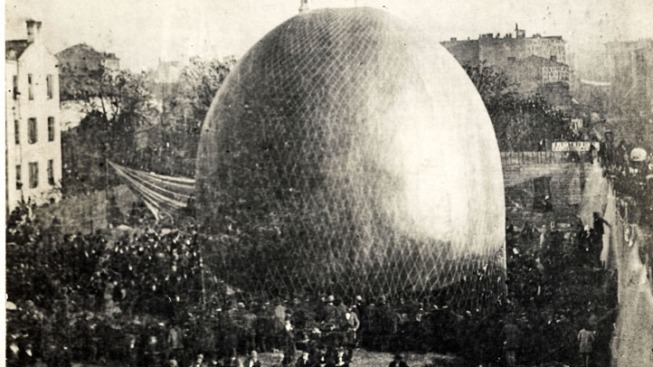 In June of 1841, Lowe blew up a similar balloon on the National Mall, to demonstrate to President Lincoln how aircraft could be used as a means of spying during the Civil War. Actors will be on hand Saturday afternoon to portray Lowe, President Lincoln, and other Union soldiers. The museum will be running an interactive event until 3 p.m.
For more details head to the museum's web page.